I recently got the chance to have a quick bite at Village Bistro, and I was pleasantly surprised. This typically Californian bistro is located right in the middle of Santana Row, which also happens to be typically Californian. The menu has surprisingly good variety, and in spite of being a bit overly faux-sophisticated the food is well crafted and not too fancy. I dread going to Santana Row. Once I’m there I like it just fine, but trying to find a parking spot is excruciating. Once I finally managed to ditch my car in an unauthorized area, I strolled over to Village Bistro to meet some people for lunch. 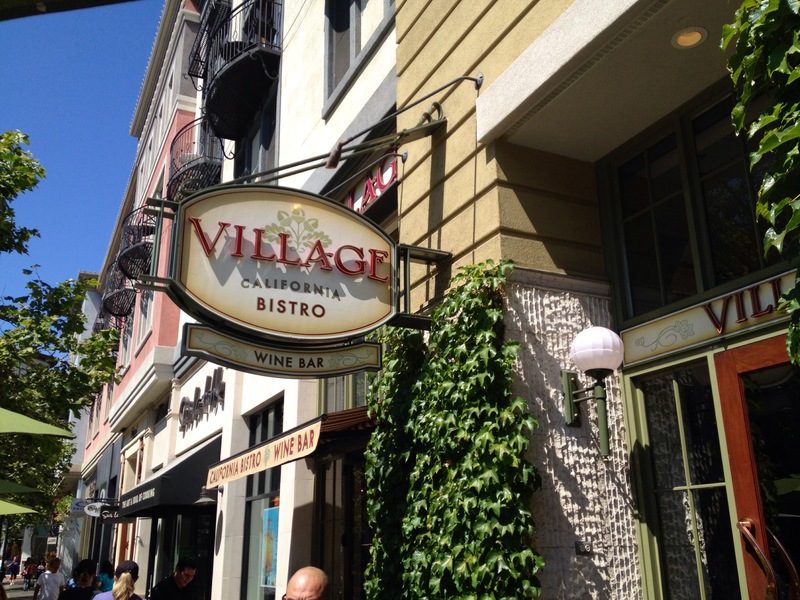 Ok, so it’s actually called VILLAGE California Bistro and Wine Bar, which is even wordier and more disjointed than one of my restaurant reviews. I have no idea why they insist on stylizing VILLAGE in all caps. There’s no need to yell at me, I believe you that it’s in a village. Just calm down. In spite of the weekend lunchtime crowd that constantly swarms Santana Row, I and the rest of my party were seated quickly in a fairly cramped booth. I guess “bistro” means “we have small tables” in secret restaurant language. Our waiter and his perfectly sculpted beard stopped by right away and got us set up with drinks. I couldn’t take my eyes off the beard. It was amazing. 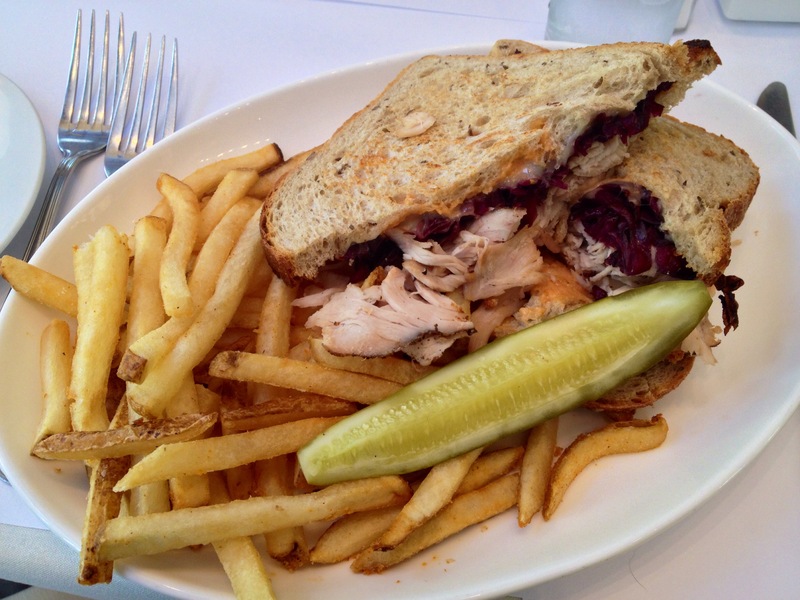 It took me a while to figure out what I wanted to eat, but I eventually settled on a turkey Reuben with fries. We put our order in, pondered the endless stream of beautiful people wandering past the window, and before we knew it our food had arrived. If you’ve never seen a turkey Reuben before, now you can say you have. To my surprise and delight, the turkey Reuben was outstanding. I’d put it in the top 20% of the best Reubens I’ve ever had; the turkey was lean, well seasoned, and not the slightest bit dry. The French fries were above average, and the oddly purple sauerkraut was delicious. Directly across the table from me was the world’s juiciest steak “banh mi” sandwich; I was fortunate enough to try a bite of it and it was excellent. I’ve had better Vietnamese-style sandwiches before, but this one was plenty tasty. I’d be happy to order one, and in fact I probably will the next time I visit. I liked Village… I mean VILLAGE Bistro (and California thingy and whatever else they said they were) and I would enjoy eating here again sometime. I rate this place 20 out of 25 unnecessarily capitalized letters – certainly worth a visit but not quite what I would consider a destination. 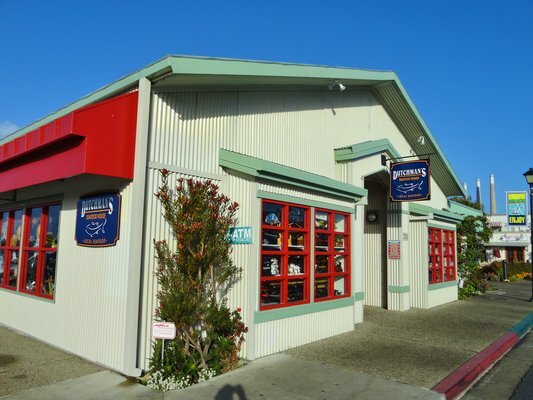 Their central location within Santana Row is convenient, assuming you are already there, their versions of culinary favorites are different enough to be interesting, and the overall quality of their food is excellent. Nothing can match the quality of that beard though. Nothing. It’s just so adorably Californian I could pinch its little cheeks. My experience at Dutchman’s was a strange one. There were some parts good, some parts bad, and many parts plain old weird. In the end, this restaurant just isn’t as good as I remember it (back when it was called The Flying Dutchman), but it’s still a decent enough place to grab a bite to eat while watching the setting sun. I love California’s central coast. Some people call it “middle kingdom”, but that’s always sounded silly to me, as though at any moment a hobbit might spring out of a hole in the ground and invite you to tea with Gandalf. The geographic area I’m talking about is San Luis Obispo county, which lies halfway between San Francisco and Los Angeles. There are a lot of good places to eat in this region, provided you know where to look. After only getting lost twice – I have the navigation skills of a heavily medicated toddler – I managed to shuttle a car load of family members to Dutchman’s for an evening meal. We put our name in for a table, and while we waited we enjoyed the spectacular view from the panoramic windows surrounding the dining area. After ten or fifteen minutes we were seated …and then nobody showed up to serve us. We browsed the menus, picked our entrees, discussed appetizers, and still no waiter. All of the tables around us were well attended, but none of the wait staff wanted to make eye contact. Empty tables nearby were seated, people got their drinks, then appetizers, and still we waited. Steam began coming out of my wife’s ears. Eventually our helpful waiter, I’ll call him Twitch, did a drive-by and said “heysorryforthewaitbethereinaminute”. Okee dokee. After a couple minutes he stopped by again and took our drink orders. “Ok, I’m going to go get your drinks, and then come back and give them to you, and then I’ll take your food orders.” Before we could tell him that we’d been ready to order for a while now, he whisked himself away to a dark corner of the restaurant and began furiously jabbing at a touch screen in an apparent attempt to stick his finger completely through it. It was like watching a rabid woodpecker go to town on a rain gutter. After a few minutes Twitch returned with our drinks, just as he had instructed himself, and began taking our orders. Awkward silence. “Oh, haha” I replied lamely. “Uh, so I guess they’re awesome?” Twitch just looked at me and said nothing. Alrighty then. 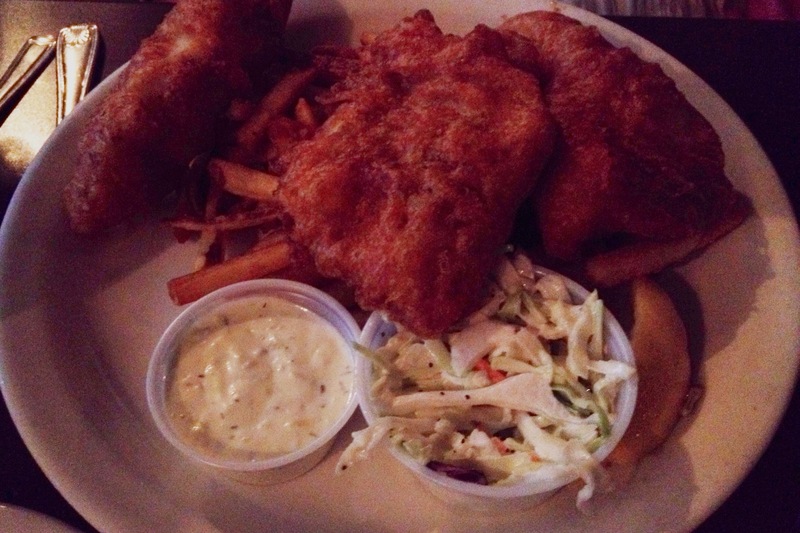 Dimly lit fish and chips. 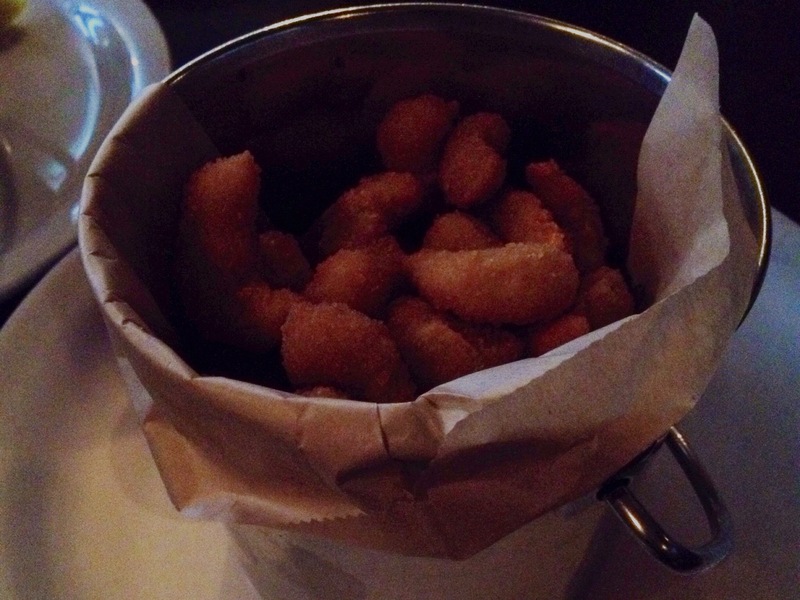 I ordered a bowl of clam chowder instead, we got some shrimp and calamari appetizers for the table, and everyone else ordered fish and chips. The food was brought out promptly by a different, surprisingly normal waitperson, and everything was …average. It certainly wasn’t bad, and in fact I would be happy to return to Dutchman’s for another meal of fried ocean goodies, but there was nothing special about it. Everything had the consistency and flavor of a typical low-to-mid-range chain restaurant, complete with generic tartar and cocktail sauces in little plastic cups. As far as I’m concerned, any seafood restaurant hoping to be considered decent must first make an acceptable bowl of clam chowder. 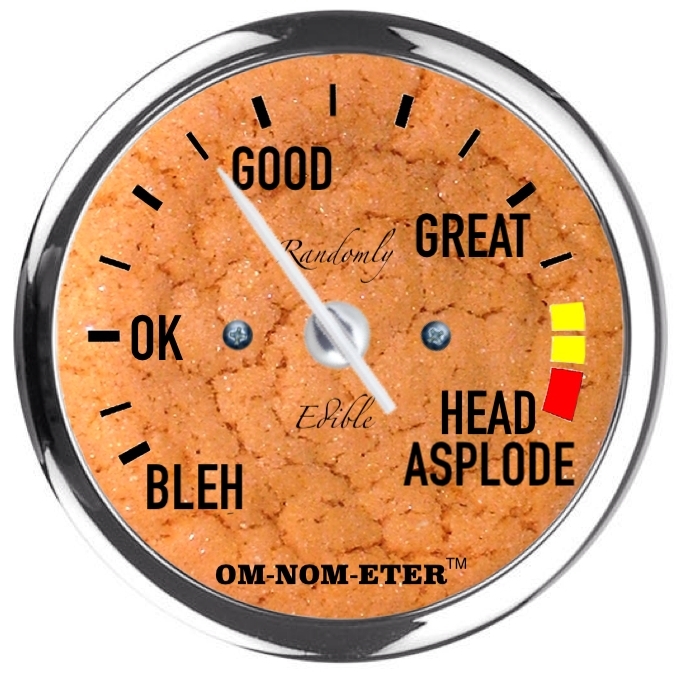 It is the first and most important test to pass, and I’m sorry to say that Dutchman’s didn’t do very well. 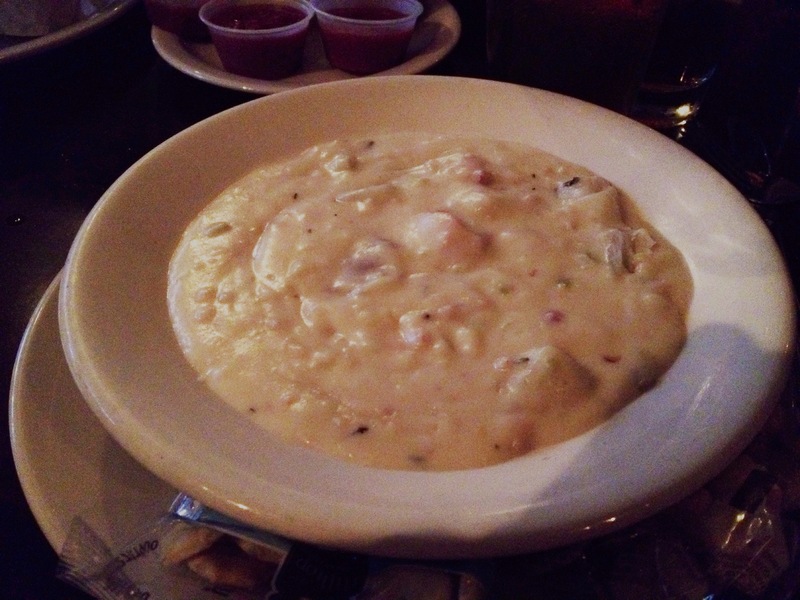 The clam chowder was gluey, bland, and almost completely devoid of clams. It was overly thick and mounded up disconcertingly in the middle of the bowl with a flavor somewhere between sausage gravy and wallpaper paste. At least the little baggies of oyster crackers were good. Twitch visited us several more times throughout our meal and continued to give himself precise instructions which he followed diligently. “I’m going to take this water glass and fill it up, then I’ll be back to take those two plates and the dish there and then I’ll come back and ask you about dessert”, and then he would whoosh off before we could get a word in edgewise. He made for an amusing experience if nothing else. In the end, I have to rate Dutchman’s a mildly disappointing 7 out of 12 buckets of clam paste. The seasoned fries were good and the view of the sunset was amazing, but the mediocre quality of the food and weirdness of our waiter put a bit of a damper of the evening. I’m sure I’ll be back the next time I’m in the area craving fish and chips, but I’ll pass on the chowder. And the fritters too apparently. Hey look, a picture that isn’t dimly lit.